In a large saucepan, cook 6 Tablespoons of the green onions in hot butter until tender; stir in flour, chives, salt and pepper. Add milk all at once. Cook and stir for 12-15 minutes es or until thickened and bubbly. Add potato pulp and half the cheese; stir until cheese melts. 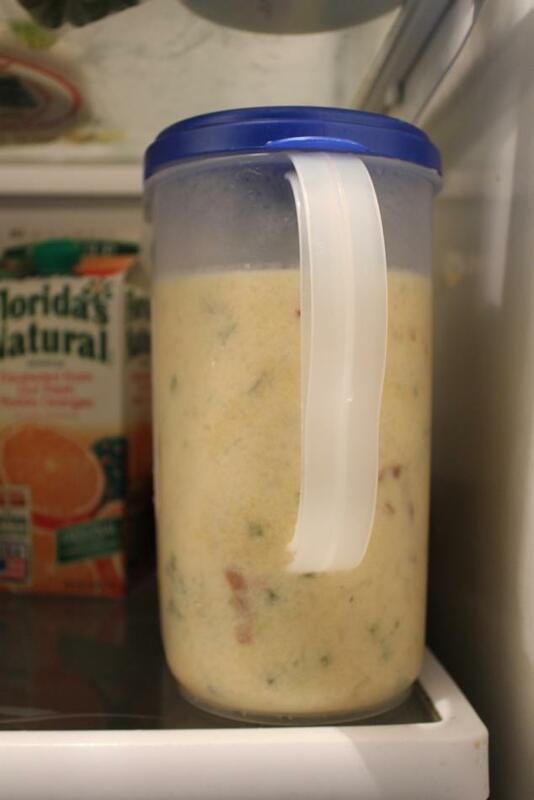 If you’re like me and HATE your big soup kettle taking up the entire fridge, try this little handy-dandy trick of putting remaining soup in a pitcher. I want to hop in my car and head to Cola. I want to try this recipe, but how big of a bag of potatoes do you use? Thanks! Does this freeze ok? I’ve heard freezing any kind of dairy doesn’t come out as good as we would like. Thanks! What a GREAT idea! Thanks so much for sharing your freezer recipes ( and your pitcher idea!) I did this for my daughter to have her freezer stocked when she came home from the hospital with baby#2 – can’t wait to do it again for myself with some new recipes! Thanks again!! Have you froze this soup before? I’m excited to try this recipe out. So I found this on your freezer meals page, I tried making a freezer meal with potatoes once and they turned black, will that happen when attempting to freeze this one since the potato is already combined/cooked? Also, do you cook it all first, then freeze? Or combine the items, freeze, then cook on the day of? Oh, I can’t stand it when potatoes oxidize!!! The great news about this is that bc it’s all combined and cooked it won’t turn colors! You cook it all the way thru the recipe then defrost and warm on the day of. Easy peasy! Hope that helps :) so glad you’re here! How big a bag of potatoes? 5#, 10# or 20#? 10 pounds if you’re using the currently doubled recipe! Hope that helps! Yes thank you. I love the hint I would have never thought of using a pitcher!! How much soup does this make? if im using gallon ziplock freezer bags about how many of those freezer bags am i going to fill with this recipe? It totally depends on how big the potatoes are and how thick you’d like the soup…My guess is 2-3 ziplock worth! 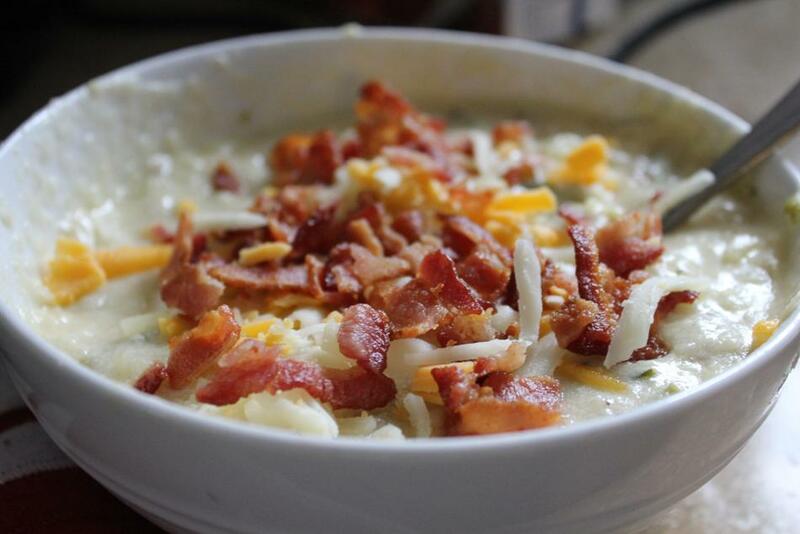 This sounds wonderful, I love potato soup! Top each what with remaining cheese, green onions, and bacon? Yes, it worked fine for this recipe!